‘Super’ controls – rich text, multi pick etc. The Tree details are grouped under logical headings in expandable panels allowing the user to focus on the specific aspects of tree management that they are interested in. TMS can be installed on a standalone PC, on a server with multiple PC access and can also be accessed remotely by anyone with an internet browser and the appropriate security passwords. This means that staff do not have to return to base to pick up task sheets, interrogate the system or report back on work completed. It also means that survey and management contractors using the system can give their clients direct access to survey results by simply allocating a password to the client, which will allow them to view, download or print results. TMS Web has been designed to be user friendly and intuitive to use. It runs in the familiar environment of internet explorer with a user group controlled interface which allows administrators to configure the system for different types of users. The interface uses familiar components such as drop down list, checkboxes, popup calendars, rich text fields, multi pick lists, data grids and a record navigation tree. Administrators can modify the look and feel of the interface using style sheets, data entry fields can be added or removed to suit exact client requirements and page format can be controlled by the user login. Report templates can be created using Microsoft Word or XML style sheets. TMS Web can use a range of corporate databases such as SQL Server (standard configuration), MSDE, Oracle, My SQL etc. All aspects of the system are optimised using presaved views and stored procedures. 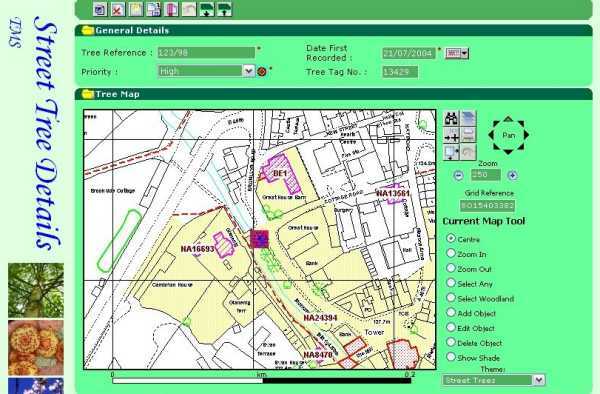 The Mapping web service can use MapInfo tab files, ESRI Shape files, Spatialware for SQL Server or Oracle Spatial. TMS Web is served entirely from one or two web servers, and so management is simple and cost effective, with no need to visit workstations. The map component is a web service which delivers the mapping for the Detail pages, Index pages and Reports. The service can be installed on the same server as the main web pages, on another server, even on a remote server such as the exeGesIS SDM server in London. The web services approach reduces duplication of effort and provides a service which all applications can use, thus saving time and money. 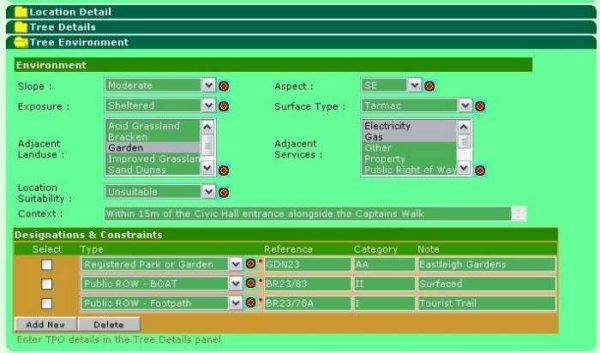 TMS Web can be supplied ‘out-of-the-box’ configured for Street Tree management, Amenity Tree Management or Woodland Management. Alternatively a completely custom system can be rapidly built or an ‘out-of-the-box’ system can be customised to meet specific requirements. The whole database and interface is data driven, with the reassurance of dynamically created ‘real tables’ which can be used for data migration and bulk data processing tasks. The TMS Web product is based on a Site Management System dynamic database toolkit which has been carefully developed to conform to current standards. All products built on this platform adhere to IT industry and geospatial standards including SOAP, WSDL, XML and .NET to ensure interoperability with other systems. Even though the system is highly functional, we have tried to keep the pricing as low as possible. Prices range from less than £700 to £2,250 'per seat' depending on how many licences are held. Additional costs depend on your detailed needs and relate to customisation, survey system, installation, training and a support and maintenance option. We will of course be happy to provided a detailed quotation on request. If you are interested in discussing your requirements or seeing TMS in action then please email tms@esdm.co.uk or call one of our consultants at 01874 711145 and they will be happy to arrange an on-line demonstration for you.